With over 300,000 people taking the GMAT every year, figures suggest that approximately 10% of students manage to receive a score of 700 or higher. For most, this high result feels far from attainable. Furthermore, there are many test takers who know someone (who invariably knows someone else) that spent as little as three weeks revising, and managed to achieve, say, a 720. This can add to the frustration of studying since such stories can make you feel inadequate or give you a feeling that you’re not doing something right. However, the reality is that while this type of result is possible after only a few weeks it is clearly not the norm, and usually only happens with candidates that already started out with 650+ on their first practice test (thus they didn’t have increase their score as much). While there are a many reasons why students fail to secure a score above 700 on the GMAT, the most significant impediment is time. Indeed, for most people to raise his or her score by 100 points they’ll need approximately 200 to 250 hours of study time. That is, if your initial test score comes in at 550, you would need something in the order of 300 to 350 hours of study time to reach the 700 level. 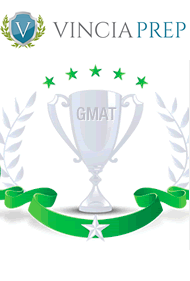 If you’re working full-time and only have 20 hours per week devoted to the GMAT, that means that you’ll need to study consistently for about 6 months. Another common reason that people fail to reach the 700 mark on the GMAT concerns the frequently troubling verbal reasoning section of the test. Improving your quantitative/mathematical reasoning skills can be more straightforward, as it’s possible to track improvements over time and direct attention to mathematical problems that are causing difficulty. Progress in the quantitative/mathematical reasoning section is thus quantifiable: you study the correct strategy, undertake practice questions, and review these practice questions to improve. Notwithstanding its sentence correction part, the verbal reasoning section of the exam is less easily improved on in such a systematic manner, particularly the critical reasoning and reading comprehension parts (improvement in these parts tends to vacillate as it progresses; see the diagram below). The black line in the above diagram reflects the ‘up and down’ trajectory of improvement when revising areas like critical reasoning and reading comprehension: as we study these areas, the frequency of correct answers goes up and down repeatedly despite a general improvement over time (as reflected in the blue line). One of the main frustrations facing us when revising these types of problems, then, is the sporadic nature of improvement: you do well one day, then less well the next. Remember: this is entirely normal! The important thing is that you keep reading and studying; improvement will naturally follow but generally requires around 250 hours for 100 points. Of course, if you’re employed full-time during your studies, it won’t be easy (or even possible) to devote all of your attention to GMAT revision over a 6 month period. Moreover, your study time will be so intermittent that you’ll need to spend more time reviewing than if you studied over a shorter time period. One potential solution would be to study for approximately 20 hours per week for 3 months, and then taking 3 to 4 weeks of vacation time from your job in order to study more intensively. There are no rules as to what you should study first: this will depend on your particular areas of weakness. Generally speaking, though, the majority of GMAT test takers should begin by revising the sentence correction part of the test (in addition to their weakest areas). The reason that many people should choose this part is, once again, the time factor: competency in this section is gained far quicker than in other sections and will allow you to shift your attention to new problems in a short space of time (i.e. the critical reasoning and reading comprehension parts of the verbal reasoning section). Granted, the above study plan is highly adaptable: if your weakest area lies in the quantitative section, you should alternate between the verbal and mathematical parts. Likewise, if you’re less confident with the reading part, pay more attention to the reading comprehension and critical reasoning aspects from the outset; you can do this by following the relevant parts in a GMAT revision book, or in a more official capacity as part of a GMAT course. Simply start by practicing these parts alongside the sentence correction part. Remember: reading ability doesn’t improve linearly; however, if you keep practicing and are consistent with your study methods, you will improve over time. If by the third week you’ve yet to maintain a 700 score, don’t be disheartened! Every single test taker improves at their own rate; if you stick to the study plan, you’ll get there eventually.